I gave some 7’s and 8’s this time on some of the posts, which I really don’t like to do. But some of them were just too short for full credit. I’m hoping that you will slow down, grab more than one idea from the text, point to specific places in the chapters, and when possible, make connections to your own writing habits or classrooms or future ideas. As we continue to norm ourselves, I put more examples that may be useful to you on our Example Student Work page from Kellie, Chelsea, and Christina. If you are wondering what I am looking for in these posts, you might check out the examples. I think sometimes you simply have a week where you have to do one post quickly and I understand. Just hoping that is more the exception…and overall, you really are writing such thoughtful responses to the ideas. A couple of you got a 5 because you forgot part 2 on our second discussion post: appendix D (researching an author from page 176). Feel free to add that if you forgot and let me know when you do. I will update the grade. I also sent a reminder to a few of you about giving feedback to peers. Some of you are just so generous in your comments and end up having full conversations with others, which I really appreciate. Others are not giving feedback at all. As future teachers, giving feedback to writing is one of the most challenging things we do. I see feedback to others as part of your professional growth in our class. Please leave enough time to respond to at least one other person when you share your response. Thank you. Mentor Texts: I got a kick out of reading your responses to the mentor texts. Glad you liked the Dragonfly book! 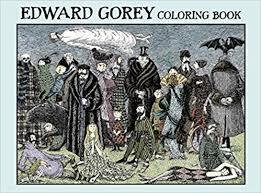 Not all of you were a huge fan of the Gorey book. So sorry! But, I didn’t mean for you to read it to kids or put it in your class library! I’ll put a disclaimer next time. 😉 I do think it appeals to the Tim Burton fans out there…in fact, Gorey is known as the “Tim Burton of his day” and the “Edgar Allen Poe after his time.” As Lisa Valdez mentioned in her response: “this reminds me of the type of book that you could picture a young Edgar Allan Poe or Wednesday Adams reading as a bedtime story. Some of the scenes made me laugh out loud, and some revisited my childhood fears, such as poor Una who was sucked down the drain. My grandmother had a bathtub that made a HORRIBLE loud, slurping, sucking sound, and I was always afraid of it, even when I knew I was too big to fit down the drain.” While I offer a ton of children’s books as mentor texts in this class, I also sometimes have grown up stuff too. Thanks for hanging in there with that one! You might also consider subscribing to any of the NCTE journals, such as English Journal or Language Arts (student prices are really reasonable). And subscribing to the NCTE newsletter is free. Make Cycle 4: Compelling Arguments is viewable on our site now. No Wednesday response this week, but a longer one is due Friday on chapters 4 & 5 and Appendix E. I’ll post a video update tomorrow. Our featured bloggers for Make Cycle 3 will be spending time with your expository texts. Shelby Baccala, Jennifer Barajas-Goodwin, Rayn Buford, Jillian Barsotti, Chelsea Peterson, Rebecca Spears, Jamie Xayacheck–I’ll send you a reminder email tomorrow. Your blogs are due by Tuesday night.